On November 3rd 1994, Luigi Ferraro turned 80. When birthdays get to these round numbers and when they involve important people, they are no longer just birthdays, they become real events. And Ferraro's eightieth birthday was memorable because of its location, the participation it received and the interest it provoked. It was celebrated on the 19th, a few weeks later due to administrative reasons, between the statue of "Christ of the Abyss" in San Fruttuoso and the water mirror of Portofino's small harbour. The Italian Navy sent a detachment of the Comsubin, lead by the Admiral Filippo Pascali in person, Commander of the Comsubin. 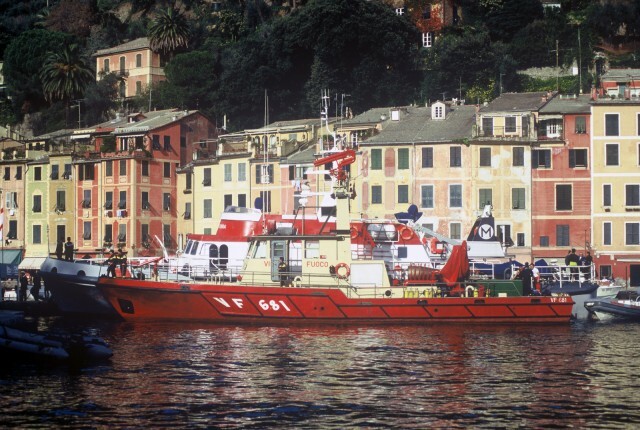 The Coastguard was present with different means of transport coordinated by Admiral Renato Ferraro (bearing the same name), the Maritime Director of Ligury and Commander of the Port of Genoa and the Fire fighters Diving Units lead by the National Manager Eng. Chimenti. The Carabinieri, the National Police and the Financial Police were also there. Among the Authorities were the Prefect of Genoa Dr. Marino, the Police Commissioner Dr. Pagnozzi, General Greco, Regional Commander of the Carabinieri, General Pochesci, Commander of Regional Operations and the Warship Captain Spanio, Commander of the Institute of Hydrography. The representatives of various National and International Underwater Federations were also present. The Italian Public Broadcasting Service (RAI) devoted over half an hour of the program Linea Blu, which at the time was directed by Puccio Corona, to broadcast and follow the event live and played an essential part in coordinating institutional organisations. In San Fruttuoso, Ferraro dived together with tens of scuba divers representing all the Armed Forces and Government Authorities as well as Fire fighters who are specialised in underwater activities, sporting associations and simple friends. After laying a crown at the feet of the Statue of Christ in memory of the fallen, Ferraro was given a memory plaque underwater by Admiral Pascali and by his vice T.V. Kuciz, as his trusted Fire fighters unrolled a long black banner with all their signatures in front of him, at the feet of the Statue of Christ. Soon after, an enormous cake appeared, lit by 80 torches, which Ferrero blew out remarkably after removing the regulator from his mouth. All the divers gathered around him, removed the regulators from their mouths and through the control of outgoing air, created an enormous column made of millions of bubbles moving up towards the surface. It was a suggestive and intense show. It should be noted that three generations of the Ferraro family were present in that submersion: with Luigi were his sons Italo and Paolo who dived with his daughter Emanuela, who was 9 years old, Luigi's niece. The underwater ceremony was broadcast at the surface to all the guests on the ferry anchored above using a closed circuit TV system. 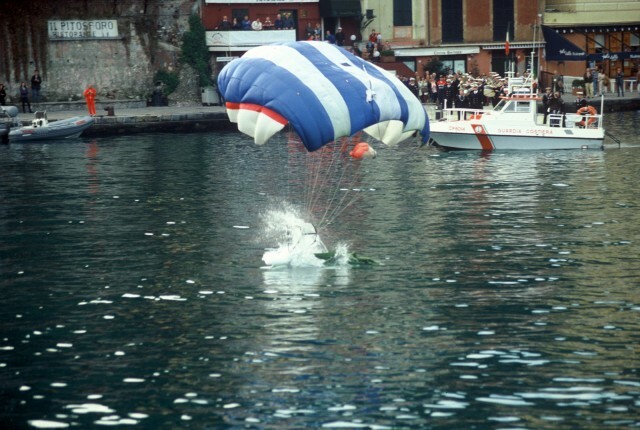 After the divers re-emerged at the surface, the program continued showing parachute launches, demonstrative operations carried out by commandos, jets of water from the motorboat and the fire fighters' pump and brass bands. At the end of the day they celebrated the evening in the historic Grand Hotel Miramare in S. Margherita Ligure, where Ferraro, who was very moved, ended the party in his honour by thanking everyone and by recounting with simplicity and irony, which were typical of his character, some anecdotes relating to his exploits. Giulio Melegari, Manager of the Underwater Activities in Saipem and Technisub, helped to organise this memorable birthday, Drafinsub, of Dino Passeri, was responsible for the closed circuit TV shoots and Arcos, owned by Gaetano Tappino, provided the logistic support. The deployment of so many means of transport for an essentially futile purpose, such as a birthday, may seem excessive. In reality, that day, all those involved in military diving activities wanted to celebrate the person who, with his exploits, contributed to transforming the Italian underwater commandos into a Legendary force. 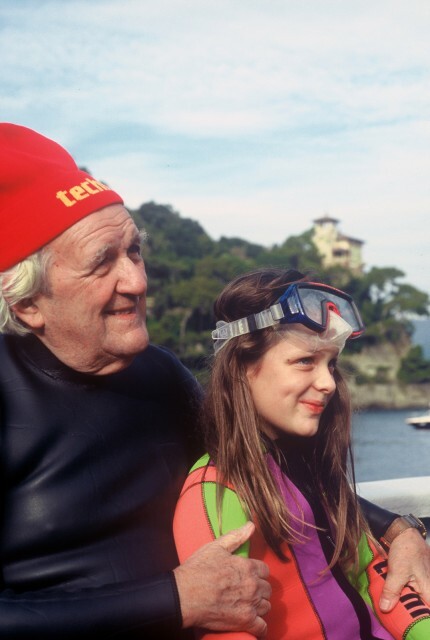 While sporting and civil divers in Italy and abroad wanted to pay tribute to a man who dedicated all his life to inventing and developing underwater activities. Ferraro, a withdrawn and modest person, was not informed about the celebration organised in his honour, otherwise he would have never authorised it. 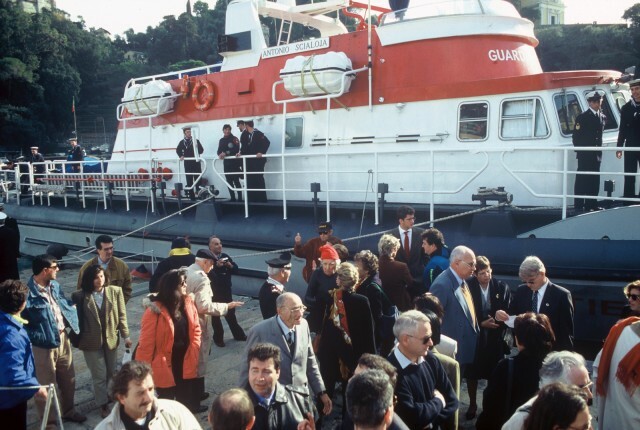 He only realised on the morning of the 19th, when he saw the craft he was aboard together with another 200 guests, which was escorted by tens of military and civil ships and a couple of helicopters. He would have wanted to look daggers at his son Paulo, responsible for all that fuss, but he never managed to catch him alone. During the evening, at the end of the event, as he returned home in his car, he drove past a platoon of commandos who were loading a lorry with a rubber dinghy, as they prepared their return to Varignano. He stopped, asked who their commander was and said to him: "I am sorry that you were mobilised only to assist this old man who dived just a few meters deep..." and the Commander, inflexible and standing to attention, answered "Commander, to have dived behind you today was an honour that I will never forget".